I had an exhibition which ran in Cork City Library in March based on my research. Entitled ‘Pilgrimage in Ireland‘, it presented information and images, as well as a DVD, of Croagh Patrick, Lough Derg and a selection of Holy Wells in Cork. 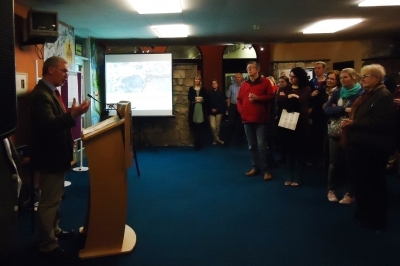 The exhibition was opened by John Sheehan from the Department of Archaeology, UCC and I said a few words, touching on some general points and making my thank-yous. Linked below is a recording of the event courtesy of Eoin O’Mahony, Department of Geography, NUIM. The process of producing the exhibition was an exciting one which allowed me to re-orientate my work towards a general audience, while also presenting it in a coherent and, hopefully, informative manner. The exhibition, which was facilitated by Cork City Library, is part of my ongoing commitment to public engagement, as I have previously discussed. It was promoted via local media and its location in the foyer of the main public library in Cork City enabled a large number of people to encounter it. The opening event was also a nice occasion for me to gather family, friends and colleagues and to acknowledge the support I continually receive. 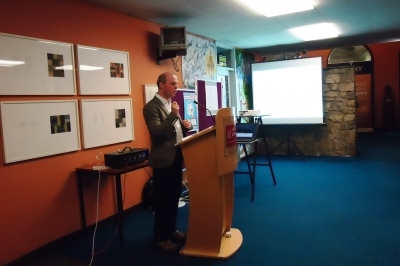 John Sheehan, Department of Archaeology UCC, opening the exhibition. Richard Scriven, Department of Geography UCC, talking.